The continent’s football governing body, the Confederation of African Football, CAF, is all set to conduct the draw for the 2019 African Cup of Nations, AFCON. The event is taking place in front of the Great Pyramids in the Egyptian capital, Cairo. A number of African football legends are in town to grace the event. It is a historic draw in its own right being the first time that twenty-four teams are going to compete and in a competition taking place mid-year, away from the traditional January – February. Our LIVE coverage brings you all the big occurrences as it happens. Whiles taking you back into some African football history facts. The following areas are covered as you scroll down. Who will conduct the draw? Egypt beat South Africa to replace Cameroon as AFCON 2019 hosts. This will be the fifth time the country is hosting the tournament. The last they organized was in 2006 when they won the trophy on home soil. They’d go on to defend the trophy in 2008 in Ghana and win it again in 2010 in Angola – their seventh title. The four other editions were in 1959, 1974, 1986, and 2006. The 2019 edition will be seeing the participation of 24 teams for the first time in its history. 1 – Egypt is hosting it for fifth time. 2 – Last time they hosted was in 2006 – they won it. 3 – The four previous hosting years: 1959, 1974, 1986, and 2006. The president sends warm congratulations to all guests present. Touts the cultural and historic hospitality of the Egyptian people. Pledges that all is been done to secure a memorable tournament in a historic country. Assures that all Egyptians are on board to welcome Africa and the world. Rallies for unity with the game and ensures all a pleasant stay. Spoke about pride of presiding over CAF at this time in its history. Praised three presidents Paul Biya (Cameroon) Alassane Ouattara of Ivory Coast and Alpha Conde of Guinea for understanding the arrangement of the next three AFCONs. Thanks Egypt president Abdul Fattah Al-Sisi and the host country for hospitality. Congratulated all guests present and the qualifying countries. Cameroon is the only Central African country in the tournament. West Africa has the largest number of teams – Nine. North and East Africa have four teams representing them. Southern Africa has six representatives. This is the first draw for President Ahmad Ahmad. 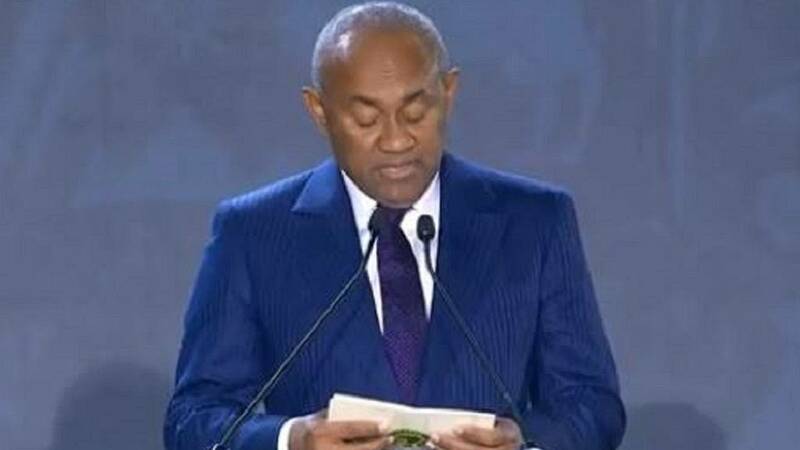 As at October 2016 Hayatou was president at the draw for Gabon 2017. The fate of several teams that will be hoping for a favorable draw will lie in the hands of mother luck, who on this occasion will be represented by Ivorian legend Yaya Toure, Egypt’s Ahmed Hassan, Morocco legend and current assistant coach, Mustapha Hadji and Senegal’s El Hadji Diouf. CAF Deputy General Secretary, Anthony Baffoe, along with FIFA president Gianni Infantino. CAF said its Executive Committee at a meeting on Thursday, 11 April 2019, in Cairo, Egypt approved the draw procedure for the tournament slated for Egypt later this year. The procedure was proposed by the Organising Committee at its meeting 24-hours earlier. The draw takes place in Egypt on Friday evening. Egypt is pooled in Pot 1 because of their status as hosts of the competition whiles Cameroon is also in the same pot by virtue of being the defending champions. Only Egypt’s slot is known because they are the first team in what will become Group A. With a little over an hour left to the main event of the day, guests have started arriving at the venue. Several football enthusiasts have been marveling at the beauty of the Sphinx and the pyramids, which will play host to the draw. And this is how the #AFCON2019 draw in Giza venue will look like at night! Beautiful. Magnificent. ?? The four times winner ???? Apparently, some of you guessed right ? YES! He is the wonder-Moroccan Mustapha Hadji.